Aerogels are ultra low density (0.04 g/cm3) which can act as porous supports, filters, etc. When coated with catalytically active materials such as ZnO, they can for a tunable functional material. Chemical mapping in 3D is needed to provide feedback on processes such as atomic layer deposition (ALD) that are used to functionalize aerogels. 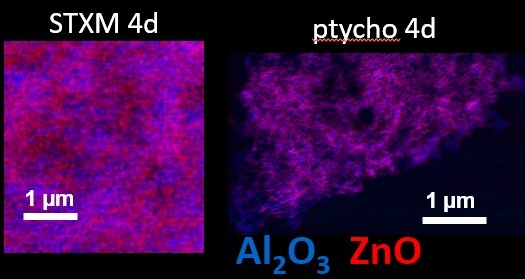 In collaboration with scientists at LLNL and LBNL, we have applied scanning transmission X-ray microcopy (STXM) and ptychography spectro-tomography to perform 4D imaging of ZnO/Al2O3 aerogels. The figure compares volume renderings of the STXM and ptychography spectro-tomo results. 2D ptychography resolution of 14 nm was achieved. OTHER INFORMATION: Movie of the ptychography aerogel 4D imaging.